We have reached the state semifinals of the Kansas high school football playoffs. Kpreps will continue to post state rankings throughout the playoffs culminating in our final poll after the state champions are crowned. Let’s take a look at the Kpreps.com rankings for November 13th. Check out our complete Rankings for further details. Derby is back in a familiar spot atop the Class 6A poll. The Panthers survived at Lawrence Free State, 55-49 in overtime. Brody Kooser’s 10-yard run in OT provided the winning points after Free State failed to score on its possession. Kooser rushed for 167 yards and four touchdowns. Free State played most of the game without star running back Jax Dineen who left with an injury in the first quarter after totaling 70 rushing yards on his first three carries. This is the third consecutive season that Derby has ended Free State’s season. The Firebirds remain highly regarded by our voters at No. 2 in this week’s poll despite the loss. Wichita Northwest moves up to No. 3 this week after blitzing Garden City, 49-6. The Grizzlies amassed more than 450 yards in the first half in defeating Garden City for the second time this season. Blue Valley enters the poll at No. 4 this week after a 48-21 victory over Olathe North. The Tigers will take on No. 5 Blue Valley North who blasted then No. 2 Shawnee Mission East 45-10. Quarterback Graham Mertz had a hand in five Mustang touchdowns in the victory. Blue Valley defeated Blue Valley North 34-33 earlier this season – scoring 10 points in the final 1:06 of the fourth quarter to win. Goddard remains in the top spot this week just edging out No. 2 St. Thomas Aquinas. The Lions were able to beat rival Eisenhower, 28-13, despite losing quarterback Blake Sullivan to an injury. Aquinas doubled-up Pittsburg 42-21 to advance back to the semifinals. Aquinas will meet two-time defending champion Mill Valley in the sub-state semifinal for the third consecutive year. The No. 4 Jaguars advanced with a 21-14 victory over St. James Academy. Bishop Carroll remains No. 3 this week after building a 17-0 lead and holding off No. 5 Maize, 26-14. Bishop Miege remains atop the 4A-I poll after a 69-point first half in beating Labette County, 69-23. The Stags will travel to take on No. 2 De Soto in this week’s semifinal. De Soto moves up one spot in this week’s poll after a 49-13 victory over Fort Scott. Miege defeated De Soto 31-0 during the regular season. Andale comes in at No. 3 this week. The Indians had little trouble with Andover Central in a 40-10 victory. Andale will travel to No. 4 McPherson in the west semifinal. The Bullpups avenged an early-season loss to Maize South by defeating the Mavericks 28-7. Maize South drops out of this week’s poll and Buhler re-enters the poll at No. 5. The Crusaders dropped a 15-14 overtime decision to McPherson in the first round of the playoffs. Buhler’s three losses this season came to Andale and McPherson, twice. The Crusaders defeated Maize South 17-14 back in Week 4. Top-ranked Scott City held off a late charge from Clay Center to win 21-13. The Beavers will now travel to No. 2 Holcomb in the sub-state semifinal. Holcomb also went on the road and advanced with a 26-6 win over No. 5 Smoky Valley. 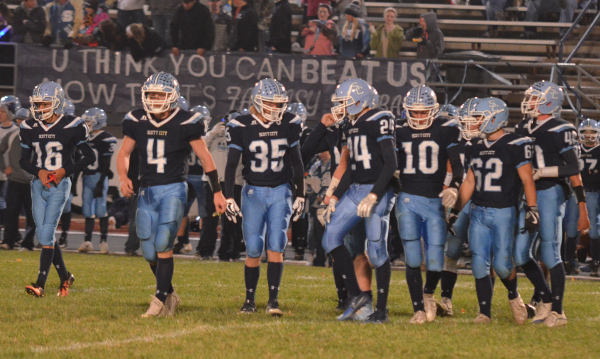 Scott City defeated Holcomb 23-14 earlier this season. Topeka Hayden remains ranked third in this week’s poll after a 30-24 win over Burlington. Hayden led 30-8 in the third quarter and pulled its starters because several had been injured during the game. Burlington scored a pair of touchdowns and two-point conversions to pull within the final margin. Frontenac enters the poll at No. 4 this week after a dominating 55-21 victory at Holton. The Raiders used a 28-0 second quarter to pull away. The 55 points were the most allowed by Holton since a 56-35 loss to Perry-Lecompton in the 2008 sub-state semifinals. The 34-point margin of defeat was Holton’s worst in at least the last 15 years. Phillipsburg went on the road and avenged last season’s quarterfinal loss to Hesston with a 47-7 victory. The Panthers had three backs rush for more than 100 yards to help freshman Ty Sides take over at quarterback for his injured, older brother Trey. Silver Lake remains in the No. 2 spot this week after a tough 13-6 road-victory over Galena. The Eagles scored twice early in the game and held off the Bulldogs to advance. Galena drops to No. 5 in this week’s poll. Marysville moves up to No. 3 this week after advancing to the west semifinal with a 42-25 win over Cheney on Saturday afternoon. The Bulldogs got 112 yards and three touchdowns rushing from Atreyau Hornbeak in the victory. Sabetha moves in to the poll at No. 4 this week after blasting Osage City, 56-13. The Blue Jays advance to the state semifinals for the first time since 2006 when the lost, 45-17, to Silver Lake. Top-ranked Smith Center cruised to a ninth consecutive victory with a 64-7 win at Elkhart. Jesse Staples led the Redmen with 259 rushing yards and scored four touchdowns in the win. Plainville advanced back to the state semifinal game with a 27-20, double overtime victory over Ell-Saline. Jordan Finnesy provided the game-winning score in the second overtime with a 10-yard run. The Cardinals then held Ell-Saline out of the end zone on fourth down to claim the win. Olpe enters the poll at No. 5 this week after shutting down then No. 2 Jefferson County North, 7-0. Blaine Hinrichs scored the game’s only points on a short touchdown run in the third quarter. Top-ranked Burlingame outscored West Elk 63-42 to earn a spot in the sub-state semifinals this week. Seth Greenwood rushed for 200 yards and scored five touchdowns to lead the Bearcats. Second-ranked Spearville scored on a Kolby Stein pass to Waylon Strecker with 1-second remaining to overcome Central Plains, 32-28. The Royal Lancers fell behind with a little more than a minute to go, but completed a successful 4th-down pass as part of a 65-yard drive with no timeouts to get the game-winning score. Central Plains, which opened the season at No. 1, is ranked third this week. St. Paul pulled the surprise of the week as the Indians knocked out defending champion Osborne, 35-24. Osborne led 24-8 in the third quarter before St. Paul scored 27 consecutive points to advance to the state semifinals for the first time since winning the state championship in 2002. Hoxie comes in at No. 5 this week after the Indians rallied to top South Central, 30-25. Hoxie will travel to Spearville in this week’s semifinal. Top-ranked Hanover was in a battle at Caldwell at halftime, but the Wildcats took control and rolled to a 58-12 win. Second-ranked Pike Valley blasted Hutchinson Central Christian behind six combined touchdowns from Cole Strickler and Davante Hammer. Central Christian came into the game as the state’s top-scoring offense at 70.4 points per game. Pike Valley will travel to Hanover in the sub-state semifinal. Otis-Bison retains the No. 3 ranking this week with a 60-14 victory over Ingalls. The Cougars will travel to Hodgeman County for a rematch with the fourth-ranked Longhorns. Otis-Bison won the earlier meeting this season, 58-26. Hodgeman County advanced with a 52-6 victory over South Barber. Mankato-Rock Hills is ranked fifth this week after finishing the season at 8-2 with losses to Pike Valley (28-22 in OT) and Hanover (64-32).